Jerry Zero, who fought the Teamsters old guard to build a more democratic union, left behind a complicated legacy. I recently learned that Jerry Zero, the former secretary-treasurer of Teamsters Local 705, of which I was a member, died on April 4. His death was announced at the regular local membership meeting on April 23 in Chicago. Jerry was seventy-three three years old and had been in ill health for a long time. He was diagnosed with diabetes in the early 2000s. His wife Linda preceded him in death. Jerry spent most of his time in retirement in Montana. A few years ago, I got back in touch with Jerry while writing my book The Package King: A Rank and File History of United Parcel Service . Jerry helped me with some of background events of the 1997 United Parcel Service (UPS) strike in Chicago — things that only he and a handful of others would have known about. His death reminded me of the good times that I had as a member of Teamsters 705 and Jerry’s importance in the era when union reform forces had an impact on the Teamsters — but also the disappointment and anger I felt when he switched to supporting James P. Hoffa Jr after decades as a reformer. Jerry, along with a handful of former leaders of Local 705 like John McCormick, was part of a generation of Teamster activists in Chicago who challenged the mobbed-up old-guard leadership when that could get you killed or seriously injured. Before Ron Carey — the Teamsters’ first rank-and-file-elected reform leader, placed Teamsters 705 in trusteeship in 1993, the local was run by such notorious figures as Louis Peick. Louis Peick, then the local’s top man, was a politically connected powerhouse in the international union who ran his domain with a steel fist. Union agents and off-duty cops broke up meetings that McCormick and other reformers called, and sometimes beat up dissidents, vandalized their cars, even threatened their families. At regular union meetings, independent-minded members who tried to speak out were at times confronted by bullies brandishing chains or beaten up. Peick died in 1986, but his successor Dan Ligurotis was even worse, if you can imagine that. In 1991, Ligurotis famously shot and killed his son in the basement of Teamster City, the headquarters of many Teamster locals in Chicago. However, it was Ligurotis’s insatiable greed and his appointment of business agents who had been convicted of extortion and arson that led to the trusteeship of the Local 705. Jerry had supported Ron Carey’s insurgent reform campaign for Teamsters general president in 1991. Carey’s election was a bombshell that shook the labor establishment and upended the cozy relationship between the old guard and major Teamsters employers, especially United Parcel Service — then as now, the largest employer of Teamsters in Local 705. The Chicago Teamsters remained a bastion of the old guard after Carey’s election until the trusteeship in 1993. Carey initially appointed his former campaign manager Eddie Burke as a trustee for Local 705, with Jerry and McCormick. Burke, however, was unprepared to deal with the complexities of such a large local union, with over fifteen thousand members and hundreds of local contracts. A year later, in July 1994, Carey appointed Jerry as trustee in Local 705. Selling off the local’s eight Lincoln Town Cars, cutting salaries (Zero’s was cut from $115,000 to $85,000, and all officers’ future pay hikes were tied to members’ contractual increases), eliminating deadwood staff positions (one high-paid business agent had only one member to keep track of), dropping lavish parties (the Christmas blowout for staff and employers — no rank-and-file members had been invited — had cost more than $30,000 in 1992), and cutting outside legal fees by half. They, however, faced a determined opposition from the old guard, led by former Ligurotis business agent Dane Passo. 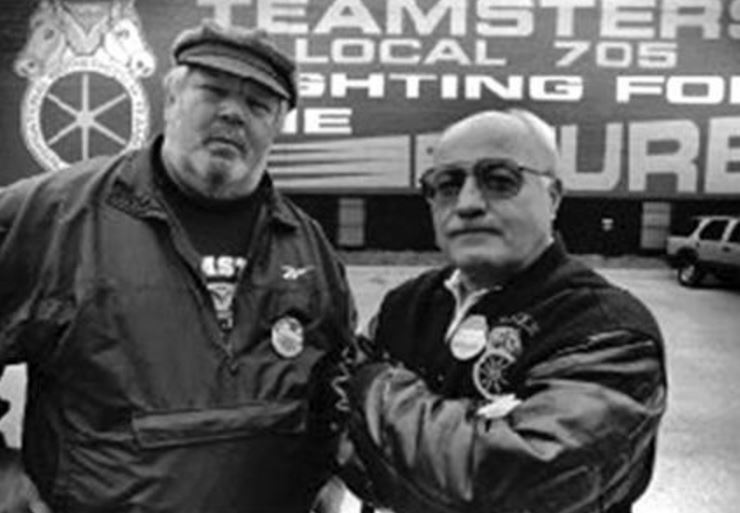 Passo declared war on the trusteeship, according to Bob Bruno, author of Reforming the Chicago Teamsters: The Story of Local 705 , who extensively interviewed him. Passo told Bruno that from the moment Burke arrived at Local 705, he was consumed with one goal: “Destroy these guys, no matter what it takes.” Passo eventually was banned from union meetings. In 1995, the trusteeship came to an end after a local union election where four slates contested for office. Zero and McCormick’s “Reform Pride Movement” slate won the election, but later lost elections in the local for delegates to the 1996 Teamster convention. A slate led by Dane Passo won and ensured that a slight majority of the convention delegates supported Carey’s opponent James P. Hoffa. Hoffa, the son of the infamous Teamster leader Jimmy Hoffa, was derided by his opponents as “Hoffa Junior.” His slate was made up of a rogue’s gallery of the most backward officials in the union. Hoffa ran a vicious campaign against Carey. But Carey won reelection by a small margin — just 2 percent of the vote — in no small part because of the votes from Local 705. Unlike Chicago Teamsters leaders of the past, Jerry sat on the national UPS negotiating committee and pledged to strike in support of the union’s demands. Carey called a national strike against UPS in August 1997 that ended with biggest labor victory in a generation. Chicago was at the center of the strike with strikers shutting down many of the city’s iconic buildings. Despite pressure from then-Mayor Richard M. Daley, Jerry kept up the picket lines at the popular McCormick Place Convention Center. Jerry called a total of three strikes against UPS — more than any other local leader in the Teamsters. He won six hundred full-time jobs for UPS part-time workers during the 1997 strike. He negotiated another five hundred full-time jobs during the 2002 UPS contract negotiations. In both contracts, he won the largest number of full-time jobs negotiated by any of the leaders of Local 705 since then. He also reconnected the Teamsters with the broader labor movement in Chicago. This was no small feat given the insular, violent, and corrupt legacy of the Chicago Teamsters. Local 705, for example, became an active supporter of Jobs with Justice. While Hoffa Junior was supporting Bush’s drive towards war with Iraq, Jerry hosted the founding the convention of US Labor Against the War. Because of Jerry, the Teamsters no longer seemed like a forbidden kingdom to be avoided at all cost. Jerry was born in 1943 and came from a Polish working-class family in Cicero, Illinois, a working-class suburb of Chicago. For most of his working life he was a truck driver and Teamster. He came from a family that David Moberg described as politically “progressive.” Jerry certainly considered himself a radical in a very broad sense. He served as president of the Chicago Metro Labor Party and signed up many of the stewards, including myself, as a Labor Party member. He even took out a subscription to the Socialist Worker newspaper that was visibly on display for all visitors to the union office. During grievance panel meetings on several occasions, I caught UPS labor managers reading Socialist Worker during break time, with bewildered looks on their faces. On two occasions, the labor manager from the UPS hub at Jefferson Street in Chicago where I worked called Jerry and demanded that I be fired as a steward. Jerry said no. But there were definite limits to Jerry’s radicalism. Though he hosted the founding conference of USLAW, the resolution putting Local 705 on record against the Iraq War came not from Jerry, but from radical activist and part-time air driver Kieran Knudson. When UPS announced that President George W. Bush was going to be visiting the Jefferson Street hub in Chicago, several of us decided we would protest against his policies by leafleting at the hub gates as package drivers were coming in. Jerry called and counseled me not to do it. We did it anyway and were well received by our co-workers and fellow union members. While these were shortcomings, there was worse to come. Jerry succumbed to many of the temptations that come from holding office in the Teamsters, where personal loyalty replaces principles and patronage replaces vision. He became increasingly intolerant of dissent in the local and would lash back at any criticism, usually at union meetings in front of hundreds of people. He fired good union reps and kept bad ones around. Many union representatives took to calling him “Boss.” There were many longstanding issues that exploded in the local, especially after Carey was witch-hunted out of the Teamsters and Hoffa took over. Jerry and McCormick split into warring camps, ending the reform coalition that had moved the union forward for several years. Jerry won the first election contest against McCormick in 2000, but as he grew increasingly unpopular, he switched his support to Hoffa, now the leader of the Teamsters after Carey’s removal from office. This was a flagrant effort to save himself that I never forgave him for. While he put me on the 2002 UPS negotiating committee for the local UPS contract, I argued for the membership to vote it down. We could have done better. I didn’t campaign for him in his last run for office in 2003. He lost in a landslide against Steve Pocztowski in the 2003 election. Jerry Zero’s legacy is a contested and contradictory one. Many who quickly denounce him never supported his efforts at reforming the local union. Others, like myself, can’t forgive him for abandoning those efforts — but remember his importance at a time when the Teamsters union was starting to live up to its awesome potential as a union that serves its members. Originally published in Socialist Worker .